Basic pallet trucks were introduced during the 19th Century, offering a safe and convenient means of moving pallets of products. Early models could only lift heavy pallets up and down. They were unable to move the pallets to another location. Modern iterations offer the ability to move pallets higher, and they also allow for the horizontal movement of even some of the heaviest items. There is also the choice between manual or electric pallet trucks, and while it might seem like the best option is always to go for a powered electric pallet, this might not be the case. Lifting and moving heavy objects is a major hazard in the workplace. Even with careful and proper lifting, it can lead to injury and stress on the body. Improper lifting can also lead to dropping items, which is an even greater potential hazard. Pallet trucks were introduced as a means of preventing injury and making the lifting of heavy objects quicker and easier. The use of pallet trucks, whether powered or manual, does require the provision of adequate training to operators, but once trained, operators should know how to safely operate, store, and use the pallet trucks. They can greatly reduce the time it takes to move objects too. If it takes two or three people to lift an item a few feet, this work can be done by a single person with an appropriate pallet truck. It will be done in a fraction of the time overall, and it will only be using the man-hours of one employee. The fact that a pallet truck only takes a single person to operate means that other employees are free to carry on with their daily tasks. Pallet trucks come in a variety of sizes and shapes. This means that however you will be using the pallet truck, and whatever the type of facility or building you’re using it in, you can find a model that best suits your requirements. As well as ensuring that you choose a truck size and design that is compatible with the items that you will be moving, one of the biggest decisions you will have to make is whether to opt for a manually operated or an electric model. There are benefits to both, so it isn’t simply a case of choosing an electric model for every application. 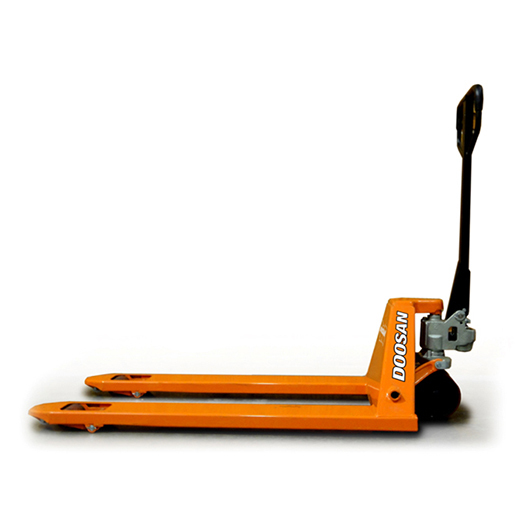 What are manual pallet trucks? A manual pallet truck works like a manoeuvrable jack, hence why they are also referred to as pallet jacks. They are hydraulically powered, and the prongs can be raised and lowered, while the whole truck can be moved by pushing and pulling it using the handles. The hydraulic assistance means that users can lift considerable weights when compared to lifting the weight by hand. Before using the pallet truck, you need to locate the release trigger, which is usually under the handle. Pulling the handle lowers the prongs so that they are closer to the floor and can be slotted under the load that you intend to lift. Move the truck into position, so that the prongs are placed carefully in the slots located under all pallets. Once the prongs are in place, pull the handle diagonally towards you to start lifting the pallet off the floor. Once the pallet is off the floor, you can move the truck to wherever you want. The first and usually most notable benefit of a manual truck over an electric one is that of cost. Manual pallet trucks cost considerably less than electric powered ones. If you only have simple and occasional need for this type of device, then a manual truck may be your best option. As well as the initial cost of the truck, it should cost less to maintain a manual model. Electrical components are more prone to damage, especially in dusty and potentially damp environments, while a little general maintenance can keep a pump truck running effectively for many years to come. If your warehouse or stock room is only quite small, you may be better served with a manual pump truck. They are easier to manoeuvre in tight spaces, and even though lugging heavy weights on a manual truck can be draining over a long distance, when moving a pallet a few feet, a manual truck should be more than sufficient. Electric trucks need charging at an electric point, so if your facility doesn’t have power, this would mean recharging the pallet truck at a different location and then moving it to your warehouse or building, which is not a practical option. What are electric pallet trucks? Electric pallet trucks like the EPT12-EZ have the same applications as manual versions, except they operate using electric charge. The machine is charged before use, typically by plugging it into the mains, and then uses this charge during operation. Some models are powered and the operator still needs to walk with the machine, while others enable the operator to stand on them and be transported with the goods. The primary benefit of an electric pallet truck is that it requires less effort to move products around your warehouse. This means that workers are less likely to suffer injury and will not be as likely to suffer strain from the use of the machine. The operation of an electric truck is quicker and easier. It will take your workers less time to move pallets from one location to another, which means that productivity can be increased significantly using one of these models. If you need to move pallets and goods over a long distance, an electric model is your best option. Manual truck operators may need to move smaller amounts at one time, which not only increases the number of trips they need to make but also increases the time it takes to complete the job. This isn’t an issue when using an electric model. There are some disadvantages to an electric pallet truck, including the cost. An electric truck costs more than a manual truck initially, and you will also find that they are more likely to become damaged and require repairs over time. If ongoing costs are an issue for your organisation, then a manual pump truck might be better for you. Although electric trucks are better for covering longer distances, they are not always as efficient over a short distance. 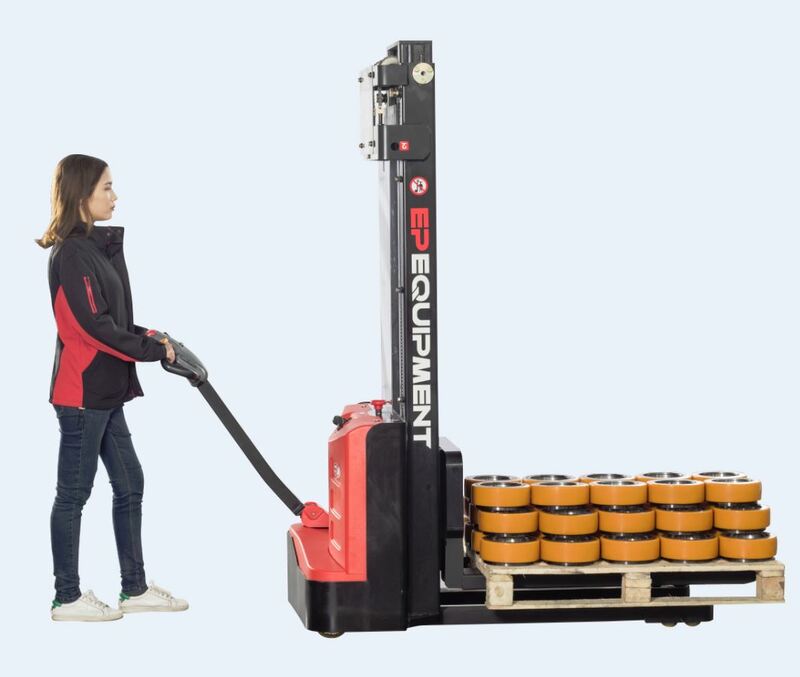 They can be difficult to manoeuvre in tight spaces, and because they are designed to carry heavy loads, they will not always stop as quickly or as easily as manual versions. However, some modern electric pallet trucks, like the EPT12-EZ truck, are designed to be smaller than their counterparts, making them easier to manoeuvre. Operators will need some training before they can safely and reliably operate an electric pallet truck. Without proper safety training, operators should not be allowed to use these models because their weight and their power mean that they could cause serious injury to people and considerable damage to property. 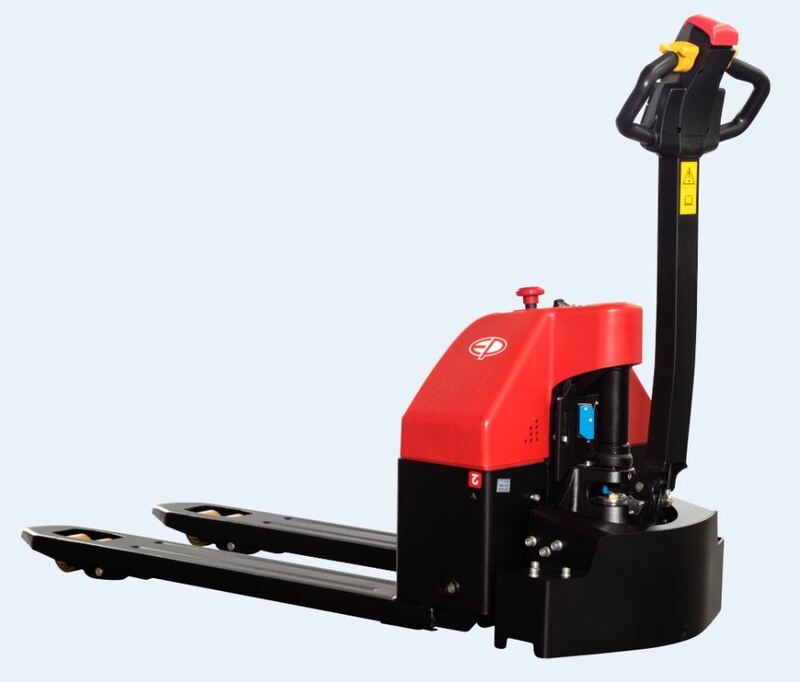 Pallet trucks are used in any circumstance where pallets of goods need to be transported from one location to another, usually within the same facility or building, although they can also be used outdoors and can, therefore, transport items from one warehouse to another in close proximity. Warehouses are the most common location for using these trucks. They make it simple to lift and transport pallets of products, so manufacturers can use them for moving goods from production line to shipping, for example. With an appropriate warehouse setup, it is possible to use them to move goods directly onto the back of lorries for transporting to shops and other locations. Shops and retail outlets can also benefit from the use of pallet trucks. Smaller stockrooms would usually benefit from a manual trolley, while larger warehouses would better utilise an electric model. Regardless of the type of pallet truck you opt for, it is important you ensure that the operators have adequate training using this type of machinery. The prongs and weight of the machines mean that they are capable of causing serious injury and potentially causing expensive damage to goods and even buildings. With the proper training, operators will better understand when to use the trucks, how to use them safely, and how to ensure that others remain safe while they are in operation. Safety should always be considered important, and appropriate safety gear should be provided to your operators. Consider your budget when buying a truck, but don’t base your decision solely on cost. If you have a large facility, remember that it could take considerably longer to move goods using a manual truck rather than an electric powered one. Over time, the additional man hours and resources will add up, and it could end up costing you more buying a manual version. Also, consider the availability of mains power – electric trucks require charging before they are used, so if you do not have access to a reliable source of power, an electric model will not be your best option.